The next generation of LED lighting is here. Experience true lighting intensity with the newly created Fluxbeam X. With its cooler design, Fluxbeam X is 20% more powerful than the previous gen. Generating a max output of 4,209 lumens per bulb @ a crystal clear 6000K Daytime White. Experiance light over 6x more intense than standard halogen. Installing is easy. Fluxbeams are sized to OEM bulb size standards and use the same style of plugs and connections as OEM bulbs. 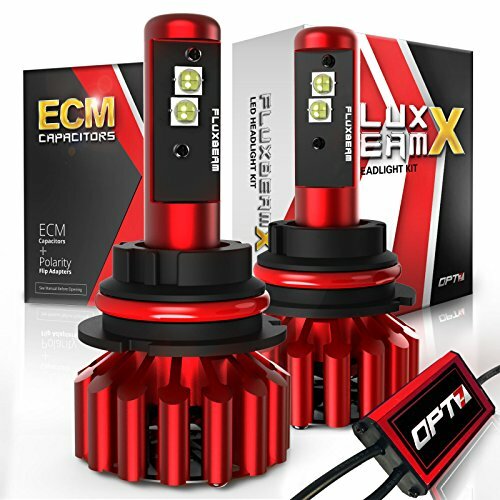 In addition, Fluxbeam includes built-in components that eliminate flicker and "Error-out" warning lights commonly associated with aftermarket lighting. SIMPLE INSTALL: Replaces standard OEM halogen or HID bulbs. Before ordering, check your vehicle owner's manual to confirm the needed bulb size for your desired application (fog, low beam, high beam). If you have any questions about this product by OPT7, contact us by completing and submitting the form below. If you are looking for a specif part number, please include it with your message.